Settler colonial governments in North America refer to several principles in international law to justify their sovereign rights to the land. Chief among these is the so-called Doctrine of Discovery, which is based on Papal bulls form the 15th century and states that Christian European nations could claim ownership over the heathen lands they “discovered”. Another is the English legal doctrine of vacuum domicilium, which stipulated that land which had not been occupied, sufficiently transformed or organized was free for the taking. Turtle Island was not “empty” or unclaimed when Europeans arrived on its shores and the vibrant native communities that occupied it used borders to demarcate their domains. But there are fundamental differences between native and European forms of ordering and bordering the land. European or Western b/ordering was based on an abstract, rational, and detached notion of ‘land’ as ‘territory’. Native b/ordering was founded on deep and experiential connections to places. The European settler colonial notion of territory made land into a commodity, which could be owned, subdivided, and sold. Maps played an important role in defining and claiming territories because they made it possible to erase native people’s domains by replacing them with blank spaces and clearly defined boundaries. The experiential, holistic, and spiritual nature of Native conceptions of land were difficult to represent in maps. In line with their oral traditions, verbal descriptions were more effective to define limits of control for native spaces. Use of these spaces varied by time of year to account for seasonal migrations or by the type of activity, such as hunting, gathering, ritual or farming. However, even though native borders were dynamic and changed shape during different times or overlapped, they still defined boundaries of native sovereign power. There is clear evidence of native b/ordering. 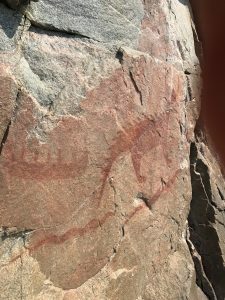 Archaeological studies show a relationship between pictographs and native domains and customary practices functioned as a passport system. For example, ceremonial pipes and trade items indicated membership in alliances. Lore, place names, and natural features communicated the extent of domains — Europeans were just not able to read and understand these mappings. Du Val, Kathleen (2006). The Native Ground: Indians and Colonists in the Heart of the Continent. Barr, Juliana (2011). “Geographies of Power: Mapping Indian Borders in the “Borderlands” of the Early Southwest. The Williams and Mary Quarterly, vol. 68, no. 1, pp. 5-46.